Advisers frequently settle for being average, and it is definitely not because they want to be average, but because they don’t really know what it takes to elevate their performance exponentially. They often ask how one professional can be so much more successful than they are and assume that there is some magic at work. The differences between the high performers and the average ones are not magic, and nor are they unachievable. In fact, they are mostly about being better organised, being more transparent, and communicating better. These are elements that any adviser can work on immediately. They get more information and know their clients better. They are focused on what matters to the client. They put the clients interests first. The high performers core business attributes? They focus on face-to-face communications wherever possible. The telephone or email is a secondary preference. They are proactive in tough times – and raise the communication levels. They play to other people’s strengths. Adviser tries to do, and be, everything. As the two types of adviser are compared it becomes obvious quite quickly that the difference between the high performers and others largely begins within the advisers own mindset and attitude. Particularly the attitude towards clients. The approach they take to their clients would appear to be the primary point of difference when you get right down to it. Combining that attitude with some sound commercial and management skill and a willingness to invest in building a business rather than executing transactions is the “magic” if there is any. Building leverage within the business and the customer experience with a great support team that plays to individuals strengths then leads to exponential growth. Add in constant quality communications and a client service focus which improves account retention and you have a winning business model. 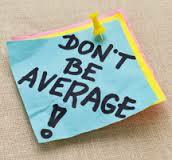 It begs the question: If that is all it takes, why would anyone settle for average? Thanks Karin. I would think that these differences are broadly applicable across pretty much any professionals services practice.